The Molecular Engineering (MolE) Ph.D. program is an interdisciplinary graduate program housed in the Graduate School, supported by the Molecular Engineering & Sciences Institute, and administered by an interdisciplinary committee with representatives from Bioengineering, Chemical Engineering, Chemistry, Electrical Engineering, Computer Science, Physics, Materials Sciences & Engineering, and Mechanical Engineering. The program offers students the opportunity to work with over 130 faculty members from roughly 20 different departments, provides access to the state of the art Molecular Analysis Facility, and also provides paid tuition combined with a highly competitive salary. The MolE Ph.D. program takes a rational approach to engineering highly-complex, multifunctional molecular systems, drawing on fundamental principles shared across various fields of engineering and sciences that develop materials with organic, biological or inorganic/organic hybrid molecular architecture. This training program provides students with a broad understanding of fundamental molecular descriptions of matter (including synthesis, modeling and characterization) and deep knowledge of molecular systems. The program trains students to become experimentalists or theoreticians who can design and characterize molecules and systems of molecules, model molecular system behaviors and inspire new molecular designs, and recognize and exploit molecular and nanoscale system constraints that impact system functionalities. 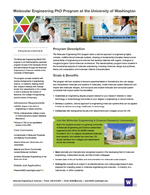 Customize an engineering degree program relevant to your research interests in clean technology or biotechnology that builds on your degree in engineering or natural science. Develop a systemic, rational approach to engineering molecular systems that can be applied in fields as diverse as energy, healthcare, or technology. Collaborate with distinguished faculty from departments and colleges across the UW. Meet nationally and internationally recognized experts in the developing field of molecular engineering, collaborative faculty, and like-minded colleagues. Access state-of-the-art facilities and instrumentation for molecular-scale analysis. Distinguish yourself as an expert in an interdisciplinary and cutting-edge research area, prepared for a leading career in molecular engineering and sciences – in industry, at a national lab, or within academia.